It took me so long to finally get my act together and attend an Improve show at the Saint John Theatre Company, hosted by the Improvisation Corporation. It was REALLY FUNNY. I think I was nervous at first to attend because I’m not into the “make fun of the audience” style of comedy. This wasn’t like that! They ask for volunteers to tell a story from their day or week and they add to it. It’s funny. 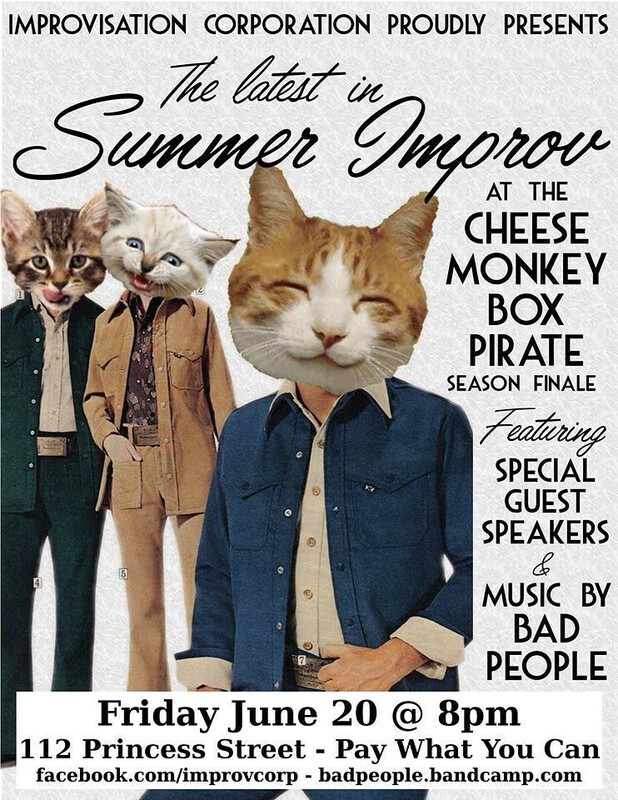 This Friday is the “Season Finale” featuring my friends, Bad People, as their musical guest. I think you should add this to your calendar. I’ll see you there. In the meantime, enjoy this interview with Scott Thomas, funny guy and great actor! Hi Scott, tell me about yourself and what you do? I’m a dad and an academic advisor at UNBSj and also a local theatre devotee. Ive been heavily involved in theatre performance and production for over 20 years now and my journeys on the stage have taken me to all sorts of places – but eventually back to my home town. Ive been working with the SJ Theatre Co for 10 years now and have operated my own improvisational comedy group (Improv Corp) for about 8 years. How did you get started in theatre? Probably doing skits around campfires at summer camp – its a tough environment – a set with live fire and an audience more interested in making out than laughing. High School theatre at St Macs really gave me the bug and just enough success to develop an ego. Later after giving up theatre forever after Bob Doherty didn’t cast me in his production of Little Shop of Horrors, I rediscovered theatre while at university. Those early theatre days in Halifax stripped the ego away and had me working as background set painter, tech crew, chorus, writer and whatever other parts I could scrape together. Over time I managed to find my way to working with some very talented and sensible people who gave me an excellent grounding in theatre performance and production. Over time opportunities came to work around the maritimes including a very fun 2 year stint with TNB. How did you get started in Theatre in Saint John? 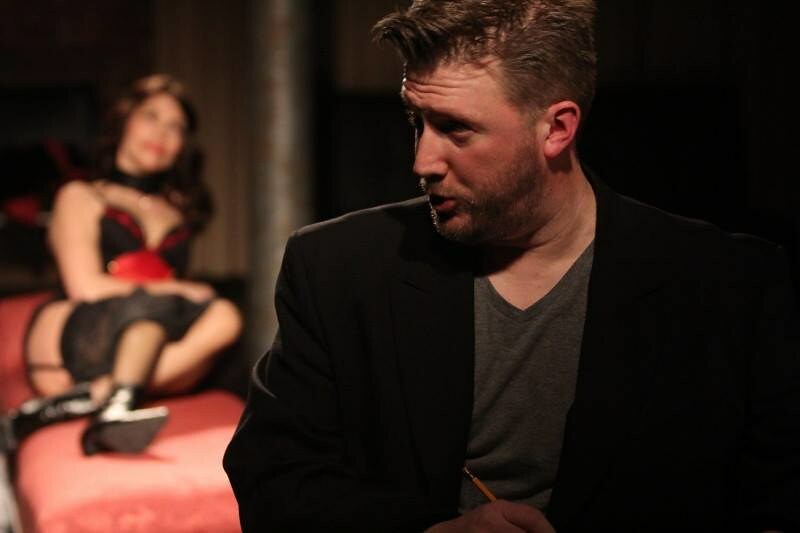 I arrived back in SJ like most people – unexpectedly – and began to seek out local theatre. I was initially going to avoid the SJ Theatre Co as I hadn’t heard very good things – but when they put out a call to do Guys and Dolls (my favourite musical of all time) I had to jump at the opportunity. Bob Doherty was the director and this time he did cast me in the leading role. Working with the company has been a great experience ever since. 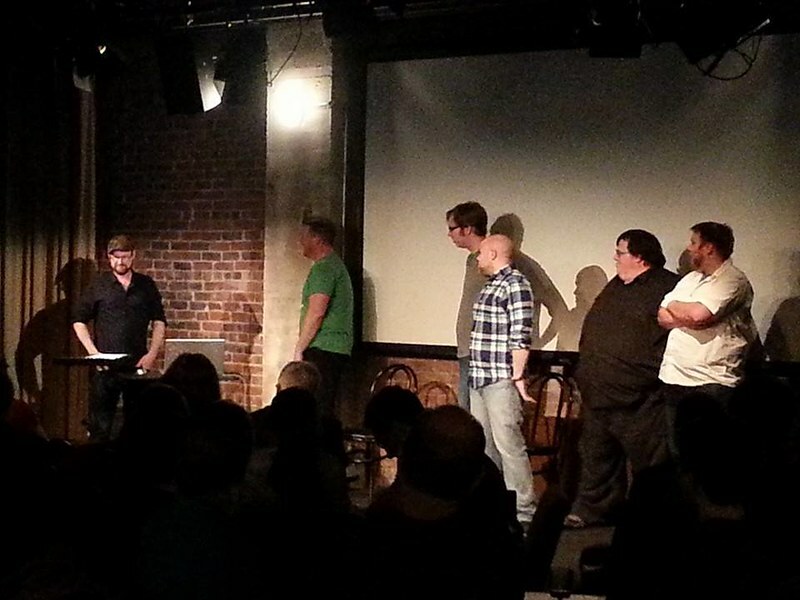 When did Comedy enter the picture… specifically improv? I have always been a comedy junkie. Growing up it was Monty Python, SCTV, Abbott and Costello, the Marx Bros, Bill Cosby, Steve Martin, Bob Newhart – you named it, I wanted to listen to it. But it was at the Halifax Fringe festival in the summer of 1992 that I saw the format I really wanted to take on. 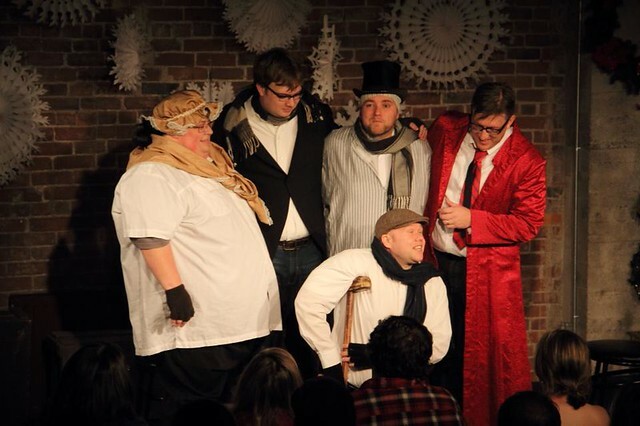 A group by the name of Scriptwrecked featuring local Halifax celebs Jamie Bradley and the late Bill Forbes did an entire show of improvised comedy. It was brilliant. 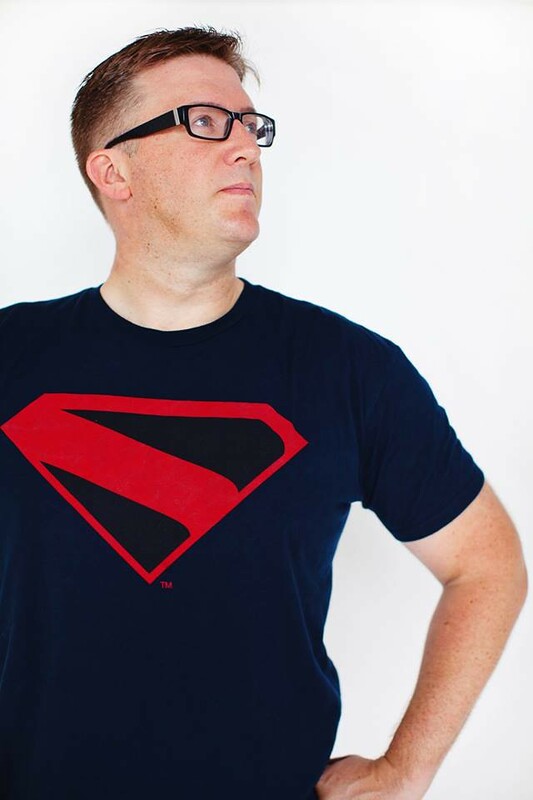 I took every workshop and training session I could find, but it wasn’t until the early 2000’s when I was settled down and had a group of like minded people around me who were equally interested in performing improv comedy. They had previously tried the format with a local group called the Comedy Knights and we relaunched the group under my direction and called ourselves Improvisation Corporation. We’ve been going for close to a decade now and have evolved through differing formats, locations and cast members – but somehow we march on. Tell me about Cheese Monkey Box Pirate? How did that get started? CMBP is our monthly improv show at the BMO Theatre on Princess St. While rehearsing for our live shows, we would often have to shout out random words to one another as inspiration. As improvisors know, there are some words and names that just keep coming back again and again no mater how random you think things are – for example – it is very common for people to use the name JOHNSON in shows. “Mr. Johnson I have your review here….” For us, the words CHEESE, MONKEY, BOX or PIRATE kept coming up again and again. So we said we would just get it out of the way by naming the show those words. Its our current series name – but that too could change – past shows have been called Potato Salad, Funzai, Comedy Night in SJ and The Maple Leaf Queens Comedy Buffet – who knows what it will be next year? What can an audience member expect at a CMBP show? We do scenic long form improv based on tales told to us by our guest stars – usually a local celeb or musician. Once we have their story we used it like a shopping list an explore the ideas and characters in a variety of short improvised scenes. Sometimes they are connected other times not – you never know. What an audience can expect is the unexpected – which is often a funny take on relatable situations. Its a fun night – we have a bar, its a cabaret party atmosphere and it’s free to get in the doors – all we ask is that you “Pay what you can” when we put out out bucket of truth. Al of our CMBP proceeds support the SJ Theatre company and we’ve already had success with helping them get new chairs and tech equipment for our current space the BMO Theatre.